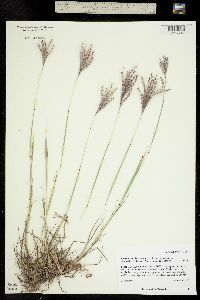 Plants usually cespitose, occasionally stoloniferous or almost rhizomatous under close grazing or cutting. Culms 30-80(95) cm, stiffly erect; nodes glabrous or short hirsute. 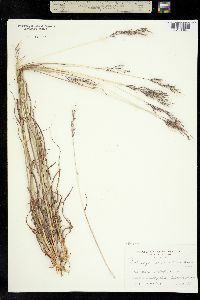 Leaves tending to be basal; ligules 0.5-1.5 mm; blades 5-25 cm long, 2-4.5 mm wide, flat to folded, glabrous or with long, scattered hairs at the base of the blade. 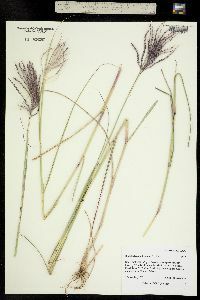 Panicles 5-10 cm, fan-shaped, silvery reddish-purple; rachises 0.5-2 cm, with (1)2-8 branches; branches 3-9 cm, longer than the rachises, erect to somewhat spreading from the axillary pulvini, usually with only 1 rame; rame internodes with a central groove narrower than the margins, margins ciliate, with 1-3 mm hairs. 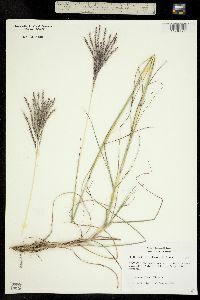 Sessile spikelets 3-4.5 mm, narrowly ovate; lower glumes hirsute below, with about 1 mm hairs, lacking a dorsal pit; awns 9-17 mm, twisted, geniculate; anthers 1-2 mm. Pedicellate spikelets about as long as the sessile spikelets, but usually narrower, sterile or staminate. 2n = 40, 50, 60. 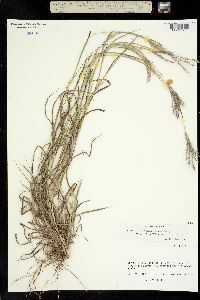 Bothriochloa ischaemum grows along roadsides and in waste ground and rangeland pastures, at 50-1200 m. It is native to southern Europe and Asia. It was introduced to the United States for erosion control along right of ways and for livestock forage in the southwest. It is now established in the region and has spread along roadsides into other central and southern states. 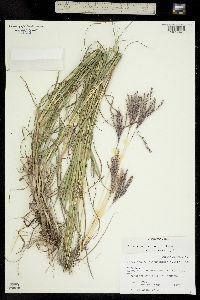 There are two variants that are sometimes recognized as varieties, plants with glabrous nodes being called B. ischaemum (L.) Keng var. ischaemum, and plants with pubescent nodes being called B. ischaemum var. songarica (Rupr. ex Fisch. & C.A. Mey.) Celarier & J.R. Harlan. 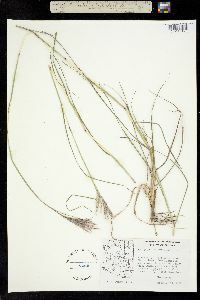 Perennials, Terrestrial, not aquatic, Stems nodes swollen or brittle, Stems erect or ascending, Stems geniculate, decumbent, or lax, sometimes rooting at nodes, Stems caespitose, tufted, or clustered, Stems terete, round in cross section, or polygonal, Stem internodes hollow, Stems with inflorescence less than 1 m tall, Stems, culms, or scapes exceeding basal leaves, Leave s mostly basal, below middle of stem, Leaves conspicuously 2-ranked, distichous, Leaves sheathing at base, Leaf sheath mostly open, or loose, Leaf sheath smooth, glabrous, Leaf sheath and blade differentiated, Leaf blades linear, Leaf blades 2-10 mm wide, Leaf blades mostly flat, Leaf blades mostly glabrous, Leaf blades scabrous, roughened, or wrinkled, Ligule present, Ligule an unfringed eciliate membrane, Inflorescence terminal, Inflorescence with 2 or more spikes, fascicles, glomerules, heads, or clusters per culm, Inflorescence a panicle with narrowly racemose or spicate branches, Inflorescence a panicle with digitately arranged spicate branches, Inflorescence branches more than 10 to numerous, Inflorescence branches paired or digitate at a single node, Peduncle or rachis scabrous or pubescent, often with long hairs, Rachis dilated, flat, central axis to which spikelets are attached, Rachis grooved, Flowers bisexual, Spikelets pedicellate, Spikelets dorsally compressed o r terete, Spikelet less than 3 mm wide, Spikelets with 1 fertile floret, Spikelets with 2 florets, Spikelets paired at rachis nodes, Spikelets in paired units, 1 sessile, 1 pedicellate, Pedicellate spikelet rudimentary or absent, usually sterile, Spikelets bisexual, Spikelets disarticulating below the glumes, Spikelets disarticulating beneath or between the florets, Spikelets falling with parts of disarticulating rachis or pedicel, Rachilla or pedicel glabrous, Glumes present, empty bracts, Glumes 2 clearly present, Glumes equal or subequal, Glumes equal to or longer than adjacent lemma, Glume surface hairy, villous or pilose, Glumes 3 nerved, Lemmas thin, chartaceous, hyaline, cartilaginous, or membranous, Lemma 1 nerved, Lemma glabrous, Lemma apex acute or acuminate, Lemma distinctly awned, more than 2-3 mm, Lemma with 1 awn, Lemma awn less than 1 cm long, Lemma awn 1-2 cm long, Lemma awned from tip, Lemma awn once geniculate, bent once, Lemma margins thin, lying flat, Lem ma straight, Stamens 3, Styles 2-fid, deeply 2-branched, Stigmas 2, Fruit - caryopsis.